Joseph Bernard “J. B.” Rivard, is best known for the breadth of his creative output. He’s written songs as well as orchestral works, exhibited award-winning paintings and etchings, worked as a reporter and journalist, published cartoons and illustrations, written novels and short stories—and, in several instances, produced many of these creations during his off hours while employed full time as an engineer. It all began in Mishawaka, a small town in northern Indiana, where his high school painting of prizefighters earned a Gold Key, the highest regional award in the Scholastic Art Competition. As a senior he produced more than forty cartoon illustrations that helped the high school yearbook win sixth-place out of 723 applicants across the nation in the National Scholastic Press Association ratings. 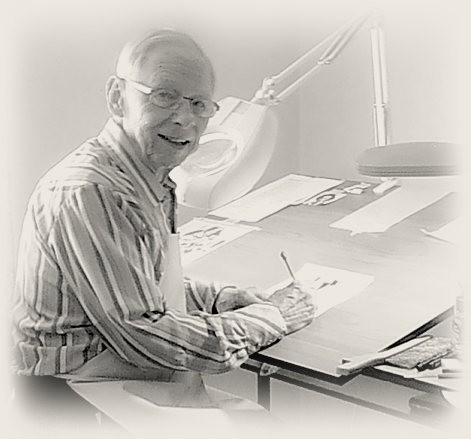 J.B. had practiced drawing since childhood, rendering everything from animals to airplanes, often copying his favorite characters from newspaper comic pages. As a teen, he’d attended a summer session at the Chicago Academy of Fine Arts, the prestigious school run by Ruth Van Sickle Ford, and began submitting to art exhibitions, at first watercolors, then later oil paintings and works in other mediums. Over the next thirty-seven years, his work appeared in more than fifty juried exhibitions throughout the U.S., including more than fifteen by invitation. As happened to many young men fresh out of high school, life was interrupted by military service, after which he graduated from the University of Florida and moved with a newly-acquired family to Albuquerque, New Mexico, to take a staff position at Sandia National Laboratories. He shortly found himself on a coral island, a member of a radar team tracking high-altitude B-52s dropping bombs over the central Pacific Ocean (these were tests during the Cold War to verify the explosive potential of the U.S. stockpile). With images of fireballs and mushroom clouds behind him, he was soon back working on the design and check-out of a test reactor through to its installation and criticality at the Laboratory. Later on he conducted research into the safety of several types of nuclear reactors, including the first-ever in-pile experiments on sodium-cooled reactor fuel, representing decay-heated fuel from a breeder reactor. But J.B. always was drawn restlessly to personal creative pursuits. During this period he received numerous awards for his artworks, including prizes at the New Mexico State Fair, exhibiting at the invitation of the State Legislature in Santa Fe, NM and in a solo show at the New Mexico Arts Commission (also in Santa Fe). His prize-winning oil painting, “The Intruder,” was purchased for inclusion in the collection of the El Paso Museum of Art. J.B.’s years at the Laboratory gained him substantial experience in writing, since most of the Research Directorate’s ultimate product was in the form of technical reports, studies, and monographs. By the time he retired as a Distinguished Member of the Technical Staff after twenty-five years, he’d authored and co-authored numerous technical papers, some of which are included in citations in current scientific literature. Now retired, he threw himself into a new art endeavor. He established the High Plateau Etching Workshop where he produced color etchings that featured the synergy of technique and expression. “I used a blend of innovative and traditional elements to create metaphors,” he is quoted as saying. “Fragmentary Man,” with its sparse vestiges of anatomical forms on an aquatinted background, marked a new and successful departure for the artist. It won the Print Award at the Salmagundi Club’s Fifth Annual Open Exhibition at its historic brownstone on Fifth Avenue in New York, an event that led to his election as an artist-member of the Club. Retirement from the Labs didn’t, however, reduce his writing. He’d moved to the Gulf Coast where he worked part-time as a deckhand on a workboat and occasionally as a mate on a charter fishing boat while contributing to the town’s small newspaper, reporting on civic and political affairs. At the same time he bylined technical articles on marine topics for WorkBoat magazine, headquartered out of New Orleans. His first attempts at writing fiction date from this time. Glancing up after reading a fragment of a short story he’d written, his wife Shirley said, “This is good enough—good enough for the start of a novel.” “Nah,” he recalls saying, “Too long. I’d never have the patience to finish a novel.” At this time they’d been married almost thirty years, the kids were grown, there was time available—and opportunity beckoned. Soon he was writing his first novel, to be called “A DANGEROUS PARALLEL.” But it was a fitful attempt, a never-to-be-published sea saga that taught him serious lessons. He gradually learned patience, and DSBYKTE—Don’t Start Before You Know The Ending. He also found, when writing in the longer form, that An Outline is Useful. For nearly a quarter century, during which he has completed a number of novels, fiction writing has occupied J.B. HANDFUL OF AIR, a mystery featuring an apartment manager as detective, appeared in 2001, earned a few good reviews, then disappeared into the remainder bins. In 2007 he finished a draft of a Chicago novel titled THE HEEDLESS SPRING, which included history on the wounding of Mayor Anton Cermak during the attempted assassination of President-elect Franklin D. Roosevelt by Guiseppe Zangara. One literary agent described it as “elegant,” but it ultimately failed to interest a publisher. The novel went through three more drafts and hundreds of submissions before being abandoned in 2010. However, at the urging of a trusted advisor in 2014, J.B. reconsidered and rewrote the entire book with a revised focus and the protagonist recast as a magician. It’s called ILLUSIONS OF MAGIC and is published as an illustrated novel with pen-and ink drawings by the author. Although illustrated (adult) novels are rare in today’s book market, J.B. hopes this novel will join those few in staging a comeback for the kind of illustrated novels that were popular with Dickens and Twain in the nineteenth century and Dos Passos and Steinbeck in the twentieth. As if he weren’t busy enough with writing and artwork, J. B. Rivard devotes some of his creative energies to composing music and writing songs. Both “The Stones of Chaco” and “Cloud Echoes” were written for full symphony orchestra. Dr. Bruce Polay, Knox Professor of Music and Conductor of the Knox-Galesburg Symphony, described “The Stones of Chaco” as “thoughtful and atmospheric.” “Cloud Echoes,” a shorter work, has been described as having “a questing quality, warm moments with a sunlit, airy feel.” J.B.’s piano compositions and arrangements have been performed in recitals in Denver and elsewhere. In early 2014, Lois Iller, a retired musician and director in Spokane, suggested to J.B. that he compose something for handbell choir. After studying the special expressions, articulations and notation required, he composed “Silver Blue” for 3-octaves of handbells. It was performed later that year by the Riverview Choir under Ms. Iller’s direction. ILLUSIONS OF MAGIC includes a fictional scene in a speakeasy, where a singer, backed by Eddie Condon’s band, performs. She sings a ballad called “I Don’t Have to Love You.” This song was composed (both music and words) by J.B. in 2012. It can be viewed and heard on this site (Song) as performed by the John Adams Group with vocal by Jennifer Barnes. This is one of J.B.’s several songs written in a popular vein, including “Golden Pool,” “Distant Train,” and “A Wandering Mind,” co-written with Adams. As a child, J.B. Rivard was often squired about the city of Chicago by relatives, especially his grandmother, who lived in Hammond, IN, a short ride from the Loop by train. These visits, which continued into his young adult life, saw him stare at the loop’s skyscrapers, ride the ‘El’ and the ‘IC,’ swoon to Chicago Jazz, sketch and paint the city’s industry and blight, peek into dives on South Clark, and drink in the glories of the Art Institute’s Van Goghs and Monets. No wonder he considers Chicago a ‘second’ hometown. No wonder he’s written ILLUSIONS OF MAGIC, about that magnificent metropolis of unforgettable characters he loves so well. For other writing by J.B. Rivard, click here.